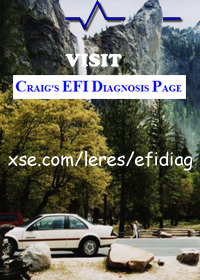 This page is dedicated to the understanding and diagnosis of electronic fuel injected (EFI) late model GM automobiles. It began as a posting to rec.autos.tech that described the things I learned while working on my own car. It exists to provide help and hints to others. The content is limited to topics I have direct experience with. Note well: The author assumes no responsibility, legal or otherwise, that might result from applying any of the information found here. My late model GM product is a 1989 Chevrolet Beretta GT. It has the 2.8L 60 degree V6 engine which is known as the LB6 motor and is identified by a "W" in the 8th position of the vehicle identification number (VIN). Note: I sold my Beretta GT in January of 2001. Its replacement was a 2000 Camaro SS which I still have. My primary car is now a 2007 Z06 Corvette. In 1990, the displacement was increased to 3.1L with a longer stroke. The most powerful of the 60 degree V6 motors is called the Twin Dual Cam. Later renamed the 3400, this 3.4L engine has four cams and 24 valves. The 3.4L has the same stroke and a larger bore as the 3.1L. The Beretta was introduced in 1987. The Chevrolet Corsica and the Pontiac Tempest are the other members of the L-body platform. Although the Chevrolet models were both produced through the 1996 model year, the Tempest was only available for a short time in 1989. Here's a picture of my Beretta taken in the Yosemite valley. The '87 and '88 model years use a mass air flow sensor. The MAF was problematic (one remedy is an updated PROM that ignores the MAF all together!) and so for the '89 model year, the engine was redesigned the from the air filter to the intake manifold. The new design does not have a MAF sensor. Instead, the air intake rate is calculated by the electronic control module (ECM) using information from other sensors. A point of interest is that the ECM used in the Beretta is the same as the one used in the Camaro and Firebird. Also, the ECM electronics are the same as used in the Corvette (but are mounted in a heavy duty box since the Corvette ECM is located in the engine compartment). The main difference between Beretta and the other platforms that the Beretta doesn't have all of the sensors the others have. I've had two rounds of driveability problems with my car, once during the five year federal emissions warranty and once after. The symptoms were that the car would occasionally deceleration stall and was suffering from idle hunting. The symptoms were worse when the AC was on, when the coolant fan was on or when the engine was open loop (i.e. before the O2 sensor was up to temperature). None of the symptoms impacted performance; gas mileage and acceleration, especially including wide open throttle (WOT), were normal.